The condition of stool and bowel movement show tell-tale signs on the overall health of the body. Diarrhea happens when stool passes through the large intestine at a faster than normal rate. If it passes too slowly, constipation is a primary concern. Bowel incontinence would be the main issue if a person has a problem regulating bowel movement. Other abnormalities in bowel movement might be signs of digestive problems. Statistics show that 15%, or 63 million, of the U.S. population suffer from chronic constipation. When it comes to diarrhea, there are 179 million cases affected from this disorder in the U.S. each year. Digestive problems are prevalent due to several lifestyle factors such as diet, related diseases, and level of physical activity. Most of these are preventable with the right treatment, proper diet, and healthy lifestyle changes. Researchers have confirmed that acupuncture, together with a moxibustion treatment, significantly reduced diarrhea, abdominal pain, and the ratio of abnormal stools. In a study conducted on patients with irritable bowel syndrome, the total effective rate was 65% as the patients experienced complete recovery with no relapses. This study, together with the analysis published in the World Journal of Gastroenterology, support the idea that acupuncture can be implemented in the primary healthcare treatment of irritable bowel syndrome. Other studies show positive results in treating digestive disorders with acupuncture. The Mayo Clinic confirms that researchers have found acupuncture to help improve symptoms for people with irritable bowel syndrome. Several small studies also suggest that acupuncture provides significant relief from chronic pain, relax muscle spasms, and improve bowel function. Researchers from the Chengdu University of Traditional Chinese Medicine also confirm that acupuncture can provide relief from constipation. Another study also found that acupuncture combined with prescribed herbal medicine can relieve constipation in the elderly. Acupuncture, together with herbs, produced a higher total effective rate with very low relapses when it comes to this digestive problem. There are certain acupuncture points that can help in bringing back balance to your gastrointestinal motility. Treatments would be done to either stimulate peristalsis or relax a spastic colon. Acupuncture helps with regulating bowel movement, reduce or eliminate pain, and help calm emotions that are associated with digestive disorders. Traditional Chinese Medicine has a holistic approach in assessing and treating digestive disorders. For example, when someone has a dry stool and it’s difficult to pass, long-term treatment can help make the digestive system less dry and herbs will be provided to moisten the intestines. When a patient has diarrhea, acupuncture will calm the large intestine and herbs can also help detoxify the body. As for patients experiencing chronic, watery but painless diarrhea, acupuncture will strengthen the digestive system and herbs will help improve digestion. Acupuncture, as a natural healing modality, can complement a healthy diet and some lifestyle modifications. Bowel movements will positively improve with better eating habits. A licensed acupuncturist will discuss these changes or improvements in diet that will best suit your health concerns. Acupuncture is a natural, effective and safe treatment that will bring a healthy balance to your digestive system. It will not only help with regulating bowel movement, but also treat the root cause of the problem. Start your way into holistic healing by setting up an appointment with our licensed acupuncturist and Chinese Medicine practitioner. Your consultation will involve a thorough assessment of your symptoms and a customized treatment plan that will address all the related factors of your digestive issue. If you’re in the Santa Barbara or Goleta area, visit us in our clinic for a consultation and treatment. We also do phone and video consultations, and shipping of herbal prescriptions to your area. Pediatric acupuncture isn’t as well-known or widely explored as acupuncture for adults. However, acupuncture for children can be extremely helpful, especially in cases where children are unable to take necessary medications for any reason. You may have some misgivings about subjecting your children to acupuncture. However, it may just be effective in addressing your child’s needs. There are actually a lot of things that can go wrong with a child’s digestive health. Babies can get colicky, and older children can have gastroesophageal reflux disease (GERD), celiac disease, lactose intolerance, food allergies, and a host of other digestive issues. These issues can manifest in a variety of symptoms, such as stomach ache, nausea, vomiting, diarrhea, constipation, and more. Stomach problems may go away after a day or so, but some can persist and happen again sometime down the line. However, stomach problems can also affect your child’s attendance at school, as well as his or her participation in extracurricular and social activities. Acupuncture can be an effective complement to medications and remedies, and it can also be an alternative if your child can’t take these medications and remedies for one reason or another. However, it’s important to remember that acupuncture isn’t a cure. It’s also best if you consult with your child’s pediatrician first to ensure that your child will benefit fully from pediatric acupuncture. Stomach pain is one of the more common complaints that children make. This usually isn’t a condition in itself, but rather a symptom of other issues. The child may be suffering from gas, acid reflux, food allergies, or mono. He or she may have also eaten something that he should not have. Children’s digestive systems can be quite sensitive, so stomach pain may happen often. Certain triggers such as fear and anxiety can also lead to stomach pain. Still, there are times that stomach pain may not be serious. However. it can also be a sign that your child needs medical attention. Consulting with your child’s pediatrician is usually your best bet. You can also talk to the pediatrician about how pediatric acupuncture can help your child manage his or her stomach pain. Diarrhea is another digestive issue that children can be prone to. There’s also the added danger of dehydration due to diarrhea, and complications may arise if diarrhea isn’t dealt with properly. Things such as bacterial infections, antibiotics, food poisoning, food allergies, and celiac disease can all result in diarrhea. While diarrhea should go away on its own in 24 hours or so, parents should monitor it especially when it comes to very young children. It’s best to consult with a pediatrician when your child begins having diarrhea to learn more about what you should watch out for. Just as diarrhea can be a dangerous illness for a child, so can constipation. If your child is having difficulty passing stool, or he has been passing stool just three days or fewer in a week, you may have something to be worried. Your child may also experience a stomach ache, pain during bowel movement, or he may also have blood on his stool. Your child’s constipation may have been caused by one of these causes. He may have fear or anxiety over going to the toilet, his routine may have changed, or he may be taking medications that can cause constipation. There are more possible causes, and taking your child to the pediatrician may be helpful in figuring out what’s causing his problems. Sometimes, constipation can lead to more digestive problems, or can be a symptom of an underlying issue. Speaking to your child’s pediatrician will let you know if you have something to be worried about. Pediatric acupuncture can help restore balance in a child’s body. Photo via Pixabay. Digestive issues aren’t always clear-cut and straightforward, especially in children. A child can be perfectly fine when you put him to bed at night, and he can be curled up and crying because of abdominal pain in the morning. Finding the exact cause of the problem may take time, but that doesn’t mean that there aren’t other ways to help children manage the symptoms of digestive issues. At the Santa Barbara Herb Clinic, you may be able to find the help you’ve been looking for. Tram Pham, our owner and Licensed Acupuncturist, can help your child get past their digestive issues. Tram has a Master’s Degree in Chinese Medicine, and she also has years of experience in providing patients with holistic healthcare based on age-old modalities. According to traditional Chinese medication (TCM), we have an energy force called qi (pronounced “chee”) flowing through our body along markers called meridians. Qi influences our health and well-being. When qi gets out of balance or is concentrated around a certain meridian, this can result in illness. In acupuncture, the insertion of fine needles into acupuncture points can stimulate the qi to return to its usual flow. Pediatric acupuncture can help children deal with pain caused by factors ranging from headaches to fibromyalgia, including pain in the abdomen. Some children may be unable to take pain medication for certain reasons, but acupuncture is an all-natural and low-risk remedy. Research has shown that acupuncture can help resolve digestive problems such as IBS. It can also help treat abdominal pain, and other signs of a distressed digestive system. There have also been studies that have found that acupuncture can help stimulate the production of endorphins. Other than that, it can normalize the body’s pain matrix as well. According to TCM, various illnesses are caused by an imbalance in the body’s energy. Acupuncture can help these issues by addressing the roots of the symptoms, such as disturbances in the spleen and stomach. If you’re not familiar with acupuncture, it may seem intimidating at first. It may seem even more intimidating to children, some of whom may also have a fear of needles. However, acupuncture needles are thinner than needles used in hospitals and clinics, and they don’t cause pain when inserted. However, patients are likely to experience a feeling of heaviness or some tingling in the needle insertion sites. It’s also important that you stick to licensed and experienced acupuncturists operating in legitimate clinics. Acupuncture has little side effects, and side effects are usually mild. However, serious side effects such as infections may occur due to the use of unsterilized needles. Fortunately, licensed and skilled acupuncturists make sure that they use needles only once and on only one person. Safety is a top priority at the Santa Barbara Herb Clinic. Here, you can be sure that your child will be in good hands. The clinic has been in the business of providing holistic healthcare since 1986, and it is still going strong to this day. 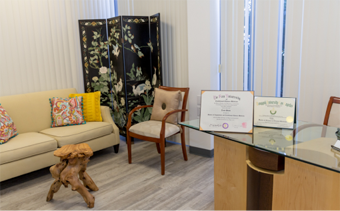 Tram, our owner and Licensed Acupuncturist, is continuing the clinic’s tradition of providing age-old treatments to people in the Santa Barbara and Goleta area. Book an appointment or schedule a consultation about pediatric acupuncture by calling us at 805-563-0222 or emailing us at info@santabarbaraherbclinic.com. Tram also conducts consultations over the phone or via video call, which comes in handy if you’re not within driving distance of the clinic. Contact us today to begin your journey to all-natural healthcare! At the Santa Barbara Herb Clinic, you’ll have the opportunity to undergo acupuncture for acid reflux. Acid reflux can be somewhat common, and it can range from uncomfortable to potentially cancer-causing. Thus, treating it is of utmost importance. However, treatment isn’t always easy or simple, and that’s where acupuncture can come in. In the case of acid reflux, acupuncture can function both as an alternative treatment as well as a complementary one. Acid reflux is also known as gastroesophageal reflux disease (GERD), heartburn, acid indigestion, or pyrosis. The condition manifests as a burning pain in the lower chest — a pain that results from stomach acid moving up into the esophagus. This is a somewhat common issue that many people experience once in a while. However, when acid reflux starts occurring more than twice a week, it has likely developed into a disease such as GERD. There are also certain foods and habits that can increase the likelihood of you experiencing acid reflux. You can take medications such as H2 blockers, which are formulated to help reduce acid production in the stomach, as well as reduce the potential damage that acid can cause. However, you can also undergo acupuncture as a complement or alternative to these medications. Our stomachs have hydrochloric acid, which can be quite strong. It helps the stomach digest food and protect from bacteria. The stomach has a protective lining that keeps the negative effects of hydrochloric acid at bay, but this lining doesn’t extend into the esophagus. Thus, when acid reflux occurs, there is a painful burning sensation involved. One cause of acid reflux is the failure of a muscle called the gastroesophageal sphincter to perform its function properly. The gastroesophageal sphincter allows food to enter the stomach and keeps the food from making its way back into the esophagus. When this muscle fails, however, acid reflux can occur. Another possible cause is a hiatal hernia. The hiatus is a wall of muscle that separates the abdomen from the chest cavity. Normally, the esophagus goes through the hiatus and connects to the stomach. However, when a hiatal hernia occurs, the stomach intrudes into the chest instead. This can cause acid reflux, let small bits of food back up, and even cause bad breath and difficulty swallowing. Unfortunately, if you have a hiatal hernia, there’s not much you can do to solve the problem at the source. However, if it’s your habits that are causing your acid reflux, some lifestyle changes may be in order. Obesity, a sedentary lifestyle, smoking, and eating habits may all increase the risk of developing acid reflux. Acid reflux may also occur due to pregnancy, certain medications, certain foods, or eating large meals. If you’ve made the necessary lifestyle changes and taken the necessary medications, but you’re still experiencing symptoms, it may be necessary to see a doctor. You should also go see your doctor if you’ve been losing weight for seemingly no reason, getting food stuck in your throat, and having heartburn for three or more consecutive days. Your doctor may prescribe medicine for you, but if the symptoms come back after you’ve finished your medication, you may need long-term prescriptions. You also have the option of acupuncture if it seems that nothing is working, or if you simply want the experience. Before you book an acupuncture appointment, however, make sure to speak to your physician about your options. Talk to your doctor first before booking your first acupuncture appointment. Photo via Pixabay. There may be a chance that you won’t be responsive to medications prescribed to you for acid reflux. Fortunately, researchers have found that acupuncture is an effective alternative for when medications aren’t working. There is also evidence that acupuncture can help improve the function of esophageal muscles that regulate the flow of stomach acid. Acupuncture is generally safe, though it may result in some bruising at the needle insertion sites as well as a feeling of heaviness. However, these side effects go away shortly, and more severe side effects are very rare and are usually the result of an inexperienced or unlicensed acupuncturist. Acupuncture is one of the most important components of traditional Chinese medicine (TCM). According to the principles of TCM, our health is governed by the flow of qi (pronounced “chee”), an energy force that flows through points in our body called meridians. When this flow gets out of sync or is concentrated around certain meridians, it results in ill health. Acupuncture is meant to restore the flow of qi and thus restore good health. At the Santa Barbara Herb Clinic, you can expect all-natural and holistic healthcare, including acupuncture. Our owner and Licensed Acupuncturist, Tram Pham, has a Master’s Degree in Chinese Medicine from Yo San University. She also has years of experience providing treatment based on the age-old principles of TCM. There is evidence that acupuncture can help improve your body’s mechanisms against acid reflux. Studies have found that acupuncture can help improve the function of the lower esophageal sphincter, which can help keep stomach acid out of the chest area. Also, a type of gastroesophageal disease called refractory GERD does not respond to proton pump inhibitors (PPIs), which are medications that decrease the production of stomach acid. However, research has found that acupuncture, can help improve refractory GERD. There is also research that has found that acupuncture can be more effective than a type of PPI called omeprazole. While acupuncture can be an alternative to PPIs, it can also work well with the medications. It’s best to consult with both your doctor and your acupuncturist to find the exact root of your acid reflux and come up with the best way to address the issue. The Santa Barbara Herb Clinic has been around since 1986, providing the Santa Barbara and Goleta area with treatments grounded in TCM’s age-old principles. Tram, our owner and Licensed Acupuncturist, took over the clinic in 2016. With her skills and experience, you can trust the clinic to provide you with effective acupuncture for acid reflux. Call us at 805-563-0222 or email us at info@santabarbaraherbclinic.com to book an appointment or schedule a consultation with Tram. Even if you are not within driving distance, you can have a consultation with Tram over the phone or via video call. Contact us today and begin your journey to holistic health. Indigestion (or heartburn, dyspepsia, upset stomach, or acid reflux) is a set of symptoms that often manifests differently in individuals. Other than what its other names imply, these symptoms include distended stomach, discomfort in the upper abdomen, nausea and vomiting, and excess gas resulting in flatulence and belching. The underlying causes of indigestion are distinct for each person as well. It is common in pregnant women, for example, especially those in the last stages of pregnancy. However, their symptoms — and causes — are often quite different from those who have GERD (gastroesophageal reflux disease). There are also those who experience indigestion due to eating too quickly and/or too much. Things like anxiety, excessive stress, alcohol, and smoking can also cause indigestion. Indigestion can also result from gallstones and peptic ulcer, and can also be a side effect of certain medications. These varying situations may perhaps be the reason why the approach of conventional medicine often falls short. Conventional medicine often simply addresses the set of symptoms. Traditional Chinese medicine seeks to correct symptoms as well as their causes. Often, these causes are unknown even to the patient, especially if it’s psychological in nature. Tram Pham, our licensed acupuncturist, will conduct a thorough consultation and examination before giving a diagnosis. This will enable her to figure out a treatment plan that will address the causes of the symptoms. No two diagnoses will be exactly the same. It follows that treatments for different patients will be different, even when they present the same symptoms. The acupuncturist would select and adjust modalities of healing. Aside from acupuncture for indigestion, there are also treatments like herbal remedies and prescribing lifestyle and dietary changes. What remains the same is the aim of correcting the energy flow throughout the body’s meridians. This will restore the proper flow by removing blockages and ultimately returning the balance that would allow the body to heal itself. An acupuncture practitioner will perform a thorough examination that seeks to pinpoint the exact nature and location of the problem. Afterward, she would select the acupuncture points in the body that have the most direct connection to the internal part concerned. Learn more about how acupuncture helps treat digestive issues. First and foremost, acupuncture for indigestion can help alleviate any emotional or psychological factor that might be causing digestive problems. The simple act of inserting the ultra-fine needles into the skin can induce the release of certain chemicals in the brain. These chemicals can lower stress, promote relaxation, and boost mood and general feelings of well-being. It can also help reduce accompanying symptoms such as nausea and abdominal discomfort. Using the distal healing technique of acupuncture known as the Balance Method, the acupuncture points selected by Tram would target the blockages in the flow of energy within the body, restoring its balance in the process, and re-enabling the body’s natural ability to heal and renew itself. The owner and acupuncturist of the Santa Barbara Herb Clinic is Ms. Tram Pham, L.Ac., who has inherited the position from the late Dr. Henry Han. As a proponent of the Balance Method which had been pioneered by the Master Richard Tan, under whom Tram studied during the last years of his life, she puts great value in a holistic method of healing, focusing on the complete wellness of the body, mind, and spirit and not just on treating an ailing body part. She harmoniously combines this acupuncture system with other traditional Chinese medicine’s modalities such as moxibustion, fire cupping, tui na, gua sha, and many others, electing and tailoring techniques to suit the exact needs of a patient. The clinic can offer more than acupuncture for indigestion. We also have an extensively stocked Herbal Pharmacy which houses various powders, herbs, teas, pills, and other rare medicinal items. People outside of the Santa Barbara area may also benefit from this and from the clinic’s other services, as we mail prescribed herbal remedies wherever you are in the country. Acupuncture works in a way that it doesn’t just treat a specific symptom, but it holistically heals an individual. For example, if you have a problem in your stomach, practitioners also take other organ systems into consideration. As a result, there’s an overall balance that can lead to a full treatment of the disorder. Acupuncture for digestive health can help boost your metabolism, regulate digestion, increase gastrointestinal muscle contraction, reduce acid secretion, and promote overall relaxation. Contemporary scientists have extensively studied the effects of acupuncture on gastrointestinal function, yet more work is necessary to make research data more reliable. However, there are pilot studies which show that acupuncture for digestive health is effective in a wide range of gastrointestinal disorders. These include gallstone disease, postoperative ileus, Crohn’s disease, peptic ulcer disease, constipation, diarrhea, irritable bowel syndrome, nausea and vomiting. A study published by NCBI in 2010 confirmed that acupuncture can inhibit intra-esophageal acid and bile reflux in patients who have gastroesophageal reflux disease (GERD). Acupuncture balances stomach acid levels, and also regulates the function of the small and large intestines. Acupuncture treatments help with proper digestion so that the body can break down food easily without bloating or accumulation of gas. This is treated by stimulating the digestive system through inserting needles on specific body points. Patients may just need one treatment alone, or regular treatments for chronic cases. Traditional Chinese Medicine refers to this health concern as the accumulation of dampness or cold in the digestive system. An acupuncture session can clear, warm and strengthen the digestive tract. This will consequently alleviate symptoms of diarrhea. Acupuncture can provide relief from ulcerative colitis and other inflammatory bowel diseases. A 2006 study by The National Center for Biotechnology Information (NCBI) states acupuncture and moxibustion have been extensively used in China to treat inflammatory bowel diseases. Now, acupuncture is increasingly practiced in Western countries. Every acupuncture treatment for diverticulitis would be slightly different for every individual. The treatment session would involve clearing the heat from inflammation and healing the digestive tract. Long-term digestive problems lead to the acid erosion of the stomach lining. A combination of acupuncture and Chinese herbs can decrease the accumulation of stomach acid. It can also bring back balance in digestion, and promote healing for the digestive system. Maybe you’ve tried various pharmaceutical treatments and drugs for digestive problems, but they haven’t completely solved your concerns. You can try undergoing acupuncture that promote natural and holistic healing for your body. As with other treatment methods, consult with your doctor first. This can determine whether or not taking an acupuncture treatment for digestion is the best way for you to address your illness. You’ll feel a slight tingling or numbness in the base where the needles are inserted on your body. The size of the needles is almost as small as hair strands. Thus, you’ll barely feel anything while lying down and letting the needles sit on your skin. Minor health concerns would usually just need one treatment session. However, chronic cases might need regular treatments, usually once or twice a week. After treatments, most patients feel relaxed and well. This is because the stimulation from the needles induces the secretion of endorphins (the “feel good” hormones). Santa Barbara Herb Clinic offers a wide variety of natural healing specialties, including acupuncture for digestive health. Our licensed acupuncturist and Chinese Medicine practitioner will interview you and give a thorough assessment of your symptoms. You will get a customized treatment plan that you can take in our clinic if you’re in the Santa Barbara or Goleta area. A prescription of herbs and recommendations on diet and lifestyle will also be provided. We also offer phone and video consultations, plus shipping of herbal prescriptions wherever you are in the world. Many people have struggled with being overweight and obese, which may result from various health factors or lifestyle choices. In fact, an estimated 160 million Americans are either overweight or obese. Billions of dollars are spent every year on weight loss and weight management programs, but it has been found that 95% fail in their attempts on losing weight. In turn, excessive weight gain can also result to various diseases that affect the mental, emotional and physical aspects of an individual. Almost 30% of the world’s population are overweight or obese. As a result, the US had the highest rate of obesity within the OECD group of large trading economies. If you have struggled with losing weight, acupuncture can definitely help in your regimen. In fact, there are studies that show that acupuncture can help you lose weight more effectively, when done alongside healthy diet and exercise habits. Practitioners deem one to three acupuncture sessions for weight management to be safe and effective in helping you achieve realistic weight loss goals. Furthermore, some people experience the effects quickly after acupuncture sessions, and they can continue with their regular treatment every other week. Kidneys and Endocrine System: These will be addressed to stimulate nerve and hormonal rebalancing, and to treat water retention. Spleen and Thyroid Gland: To bring balance to your hormones and blood sugar levels. Ear Stapling: This method manipulates points on the ear that help control food cravings and stimulate metabolism. Medical Acupuncture published a study about ear acupuncture combined with a 2,000-calorie diet and 15-minute walk a day helped subjects lose weight. Those who took a 15-minute ear acupuncture session every week lost an average of 10 pounds. Acupuncture can also stimulate the release of endorphins. As a result, this can create a relaxing and calming effect that help promote healthy eating habits. If you overeat due to stress, anxiety or frustration, acupuncture can help you become calm and control your appetite without having to resort to drugs. Learn more about the effects of acupuncture on a person’s weight. Does an Acupuncture Treatment Hurt? Acupuncture patients are usually surprised that the treatment doesn’t hurt. Thus, the treatment is relatively pain-free. At most, people may experience a dull ache or slight tingling feeling around the base of the inserted needle. These sensations are usually brief. If you have a low tolerance for pain, or are afraid of needles, you’ll only find brief sensations of jolts or tingling. During the entire acupuncture session, you may notice that you can barely feel the needles at all. With a combination of acupuncture and ear stapling, many patients have lost 1 to 2 pounds every week and lessened their food cravings. It is definitely not a quick fix, but it helps you lose weight more effectively. Regular exercise and sticking to a healthy diet are still crucial in achieving your weight loss goal. Santa Barbara Herb Clinic offers a wide variety of specialties that cater to many health issues, including weight management. Our holistic approach to treating the causes of weight gain will help you lose weight naturally and effectively. See our line of specialties that can help you achieve a healthy lifestyle and optimum wellness. Stomach problems or abdominal disorders can cripple a person’s day-to-day living. If you are suffering from stomach upset, you’re not alone. Indigestion, or dyspepsia, affects nearly 20% of Americans. 20% of the adult population also suffer from symptoms of Irritable Bowel Syndrome. There are a lot of common causes of digestive problems – including infections, spoiled food, or unclean water. However, you can turn to acupuncture for stomach problems to help you deal with the effects of all these issues. Practitioners have used acupuncture extensively to treat gastrointestinal issues. It will help you manage the condition of your stomach and all related organ systems. An acupuncture treatment will address the root cause of concern, and also support an overall healthy balance in the body. In Traditional Chinese Medicine, the stomach is one of the longest meridians in the body. It has 45 acupuncture points in it, which an acupuncturist will work on to treat symptoms. When the stomach gets stressed out or weakened, there may be an imbalance in the Qi (energy flow). In turn, this leads to disorders such as nausea, vomiting, indigestion, belching, bloating, heartburn, and acid reflux. Other acupuncture points are along the spleen, kidney and liver. The spleen is “the sister organ” of the stomach. Meanwhile, the liver is related to the flow of emotions of a person, so when there’s stress or tension, it makes the stomach become out of balance. The kidney, on the other hand, functions in warming the organs in order for them to work optimally. If the kidney weakens, it will cause the stomach to weaken as well. The inflammation of the stomach lining also causes stomach pain or gastritis. It may be related to a lot of different conditions that can be traced back to disorders in the stomach. The Traditional Chinese Medicine approach to this problem is to take a closer look at the specific symptoms of the patient, and determine the root cause of it. The practitioner will then implement the best approach to treatment after the assessment. Acupuncture for stomach problems and a prescription of herbs can resolve gastritis, strengthen the digestive system, and prevent stomach disorders from reoccurring. The Journal of Alternative and Complementary Medicine published a meta-analysis study which support the usage of acupuncture for people who suffer from dyspepsia. This health issue, which is described as a chronic disorder of sensation and movement in the upper digestive tract, may leave individuals to suffer from nausea, intense hunger, bloating, or general discomfort. Thus, practitioners insert needles into certain acupuncture points in order to bring back balance to your digestive system. A licensed acupuncturist will ask you about your history of medical issues, eating habits, medications taken, and other things related to your health concerns. There might also be a pulse reading and tongue evaluation which will provide information regarding the condition of your stomach. Also, your acupuncturist will make a treatment plan to address the disorder. At the end of the session, your acupuncturist may prescribe herbal formulas to complement your treatment. You’ll feel a slight tingling or numbness in the base where the needles are inserted in the acupuncture points of your body. The needles are as thin as hair strands, so you’ll barely feel anything while lying down. Most patients feel relaxed after acupuncture because the stimulation from the needles induces the secretion of endorphins. Santa Barbara Herb Clinic offers a wide variety of natural healing specialties, including acupuncture for stomach problems. 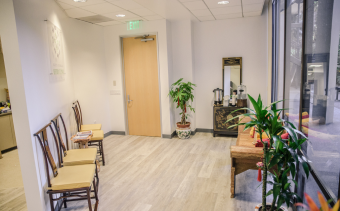 Our licensed acupuncturist and Chinese Medicine practitioner will provide a thorough assessment of your symptoms and implement a customized treatment plan that you can get in our clinic if you’re in the Santa Barbara or Goleta area. We can also ship you a prescription of herbs straight to your doorstep. Our acupuncturist, Tram Pham, also does phone and video consultations if you can’t come by our clinic. Can Acupuncture Help Regulate Metabolism? Some people are born without the need to make the effort to regulate metabolism. This allows them to quickly digest food, absorb nutrients, burn fat, and efficiently make use of the energy produced. Others are not quite as lucky. Worse, as we all get older, our metabolism also goes on the decline—even those of the lucky ones. Usually, even having a healthy diet and living a reasonably active lifestyle are not enough. Declining metabolism can transtale to increased weight, less efficient digestive capabilities, and more hunger pangs felt throughout the day. This natural decline of metabolism, which can also be a common occurrence in younger people, needs regulation. Those already prone to disproportionate weight gain might also come to struggle with diseases associated with it. These include diabetes, high blood pressure, and heart problems. In recent years, there has been quite a buzz surrounding acupuncture’s weight-reducing effects. Studies conducted on the subject in Australia, Germany, and Korea — just to name a few — contributed to this buzz. These have all produced results that are largely in favor of acupuncture. The studies specifically highlighted how regularly receiving the treatment over a stretch of time can help lower BMI or body mass index even without changes in diet and activity. In the studies where these factors were also included as part of the acupuncture experiments, the results were even better. Acupuncture and weight loss — is there a connection? But the truth of the matter is, weight loss may simply be taken as a side effect in this regard, albeit a highly desirable one. The bodily function that acupuncture truly seeks to correct is the digestive system. If it succeeds in that, we now know there are perks and other far-reaching consequences we can look forward to. According to traditional Chinese medicine, there are interconnected streams throughout the entire body where “Qi” or energy is constantly flowing. At least, it should be. When blockages occur at sites within these streams, or “meridians,” the flow of energy is disrupted, and this results in the diverse health problems we experience. Acupuncture is one of the modalities that Ancient Chinese medical practitioners devised to remove such blockages and restore the proper flow of energy within a patient. Both in theory and in practice, once the flow of energy is as it should be, the body attains balance and regains the capability to put itself to rights. A slow metabolism even in younger individuals can be due to various causes. The prime causes may include thyroid dysfunction, lifelong improper diet, and (believe it or not) over-thinking. As mentioned earlier, through the energy meridians in every conceivable part of our body, everything is interconnected. If something goes wrong with one part, you could feel the effects on another part, even those that seemingly have nothing to do with each other. For instance, stress is infamous for causing uncontrollable cravings for unhealthy food. Learn more about how acupuncture can help manage weight. How does acupuncture help regulate the metabolism? As another example, one of the most common symptoms of anxiety is irritable bowel syndrome or IBS. Though modern science hasn’t yet arrived at a concrete explanation as to why, they at least acknowledge that there is a correlation. According to traditional Chinese medicine, due to the amount of energy going to the mind as it thinks and thinks, it steals away the energy that should have gone to efficient digestion and nutrient absorption. Thus, even when a person does observe proper and nutritious diet, it may not be enough. Most of that effort would go to waste if the mind is also full of problems at all times. As the first order of business, acupuncture would seek to calm the body and quiet the mind. Ideally, this would also give the patient the strength of will to enact changes in his or her life for its overall improvement. At the Santa Barbara Herb Clinic, acupuncture treatments often come hand-in-hand with herbal remedies as well as with nutritional recommendations. The acupuncturist goes deeper into the cause of the metabolic problems and tailors the acupuncture treatment accordingly to correct them. She would also guide the patient on the ways they could take to achieve and maintain a good state of health for the long term. Seeing and feeling the positive effects of the treatments almost always points them to the right choice. Tram Pham, L.Ac. is the latest owner and lead acupuncture practitioner in the renowned Santa Barbara Herb Clinic. Dr. Henry Han, who passed away in tragic circumstances, previously ran the clinic. Tram is one of the last students of Dr. Richard Tan, the Master and pioneer of the distal healing system of acupuncture known as the Balance Method, which heavily focuses on holistic healing. This method seeks to treat not just the specific ailing parts but the body’s entirety, and this includes issues of the mind and spirit as well. Acupuncture along with other traditional Chinese medicine’s healing modalities, including fire cupping, moxibustion, tui na (acupressure), and herbal remedies, are combined seamlessly to suit highly particular conditions. The clinic also has a Herbal Pharmacy which has an extensive stock of medicinal powders, herbs, teas, and pills. This gives an option to patients living outside the Goleta and Santa Barbara area to receive their herbal remedies through mail. Similarly for those who would like a consultation but couldn’t make a trip, the clinic offers consultations via phone or video call after setting an appointment. Posted in Digestive HealthTagged digestive health, metabolismLeave a Comment on Can Acupuncture Help Regulate Metabolism?